Sanalite® is a premium cutting board material with a surface that is easy on cutting blades. Sanalite is used in a wide array of applications — from home use to commercial food preparation and some of the largest packing plants in the United States. Sanalite® is available in two formulations — high density polyethylene (HDPE) and polypropylene — both in a "natural" color. Sanalite® HDPE can be ordered in three different sheet sizes: 48" x 96" and 48" x 120" sheets with gauge sizes ranging from 1/4" to 1"; 60" x 120" sheets with four gauge sizes ranging from 1/2" to 1". 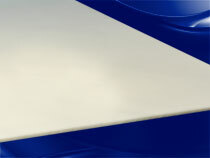 Sanalite® polypropylene is a harder surface, and comes in 48" x 96" sheets with three gauge sizes raging from 1/2" to 1".